When you install Customized Secretary reveal the top 5 cards of the stack. You may host any number of revealed programs from your stack on it. Shuffle your stack. click: Install a hosted program, paying all install costs. When the Runner installs a program from Customized Secretary, does it remain hosted? No, the program moves off of Customized Secretary and is installed in the rig as usual. Tutor is a term borrowed from Magic the Gathering for a card effect that finds the card you need from your deck. It's not as though Shapers were hurting for program tutors. So, what does Customized Secretary have to offer that the others don't? The thing that makes Customized Secretary unique is that it could potentially fetch you up to 5 programs. However, this also makes it only a pseudo-tutor since this random sampling of programs may or may not contain the one you need right now. In almost all cases this is inferior to SMC which installs the card you need in any action window, or to Test Run which can fetch programs from the heap as well and pairs nicely with Scavenge. So, can we find any reason to play this card? Clearly, we need a deck chock-full of programs to get value here. If that were the case, Customized Secretary becomes like Batman's utility belt allowing you to pull out just the tool you need for each job. What charming academic do we know that loves playing lots of programs? None other than The Professor: Keeper of Knowledge. Of course, even in a deck full of program you can easily miss the one you need. Sure, you could Scavenge Customized Secretary to use it again, but there are far better targets. You are already playing the The Professor: Keeper of Programs and Customized Secretary, might as well go full jank and slot Brahman to recycle this. Sahasrara makes it free to install. For every program on Customized Secretary you save one click (the drawing of it). If you want to get your draw+install clicks back, you need about 40% of your deck being programs, e.g. 18 of 45 cards. The programs on Customized Secretary get the main advantage of being in your grip (you can install them) but can't accidentally get trashed as easily and they aren't milling your grip with cards you don't need yet. You can use Customized Secretary to get cards into your heap, by trashing it. Say paperclip. To many programs in your stack, you don't need anymore? Customized Secretary will thin them out for you. 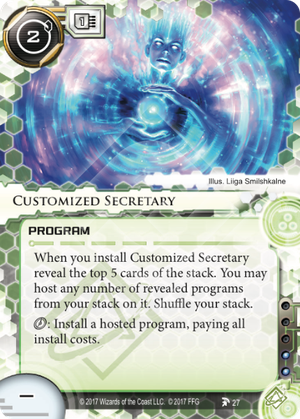 I like Customized Secretary from the perspective of game design: It does a lot of different things for you, non of which by itself are really strong, but together it might be playable.